I will personally work with you to find the right real estate investment. In my 20 years in the business, I have learned what it takes to make a condo investment a profitable one and which neighborhoods make the best investments. From the beaches of lower Alabama to Eastern Shore of Mobile Bay, if you need advice on your next real estate investment, let my experience work for you! 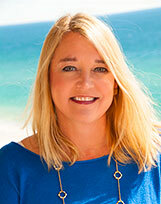 Dana helped us purchase a beach condo in Gulf Shores this year. She has a tremendous amount of experience and knowledge of the area. It helped us get the right condo at the right price. Best experience I have ever had with a real estate professional. I would give her my highest recommendation.